Last night, I spent the better part of an hour wrapping up 25 Christmas books. I did it even though I had a dozen other things demanding I give them that hour. Some of you will say, "Couldn't you have simplified your life by not wrapping all those books this year?" To which I'd answer, "Yes." Others of you will say, "Nothing says you had to have all 25 wrapped up for the first day of December. Couldn't you have only wrapped up one or two and finished wrapping the rest later?" To which I'd answer, "Yes." "So why, WHY, did you spend that precious hour wrapping two dozen books?" Simply this: I wanted to send a subtle message to my kids: In our family, books matter. They matter so much that we make them a central and important part of our holiday traditions. Did you catch the message there? It's not, "Go out and buy 25 Christmas books and wrap them all up so that your kids can unwrap one each day until Christmas." The message is this: In your family, find a way to make books matter. You might do this through a book countdown (and if you need ideas for great holiday books, you can check out my 2012 or 2013 posts on the subject). But there are a million other ways you can send that message to your kids, each one unique to your family. You might read a chapter each evening from a favorite Christmas book. You might take a family trip to the bookstore and pick out a new book to add to your collection. You might take one favorite book and do some fun activities based on it. You might cozy up in the glow of the Christmas lights and read through a whole stack of your favorites in one sitting. When I was growing up, my dad always read The Forgotten Carols aloud throughout the entire month, and we listened to the accompanying music over and over again. It doesn't matter so much what you do as just that you do something. When my kids woke up this morning, they were thrilled to see that stack of presents to kick off the first day of December. It doesn't matter that they've seen all the books before (all but one--I added a long-time favorite, Santa Claus: The World's Number One Toy Expert by Marla Frazee, to our collection this year). In fact, opening up those well-loved books just shows them that books keep on giving, year after year, growing more loved with each reading. 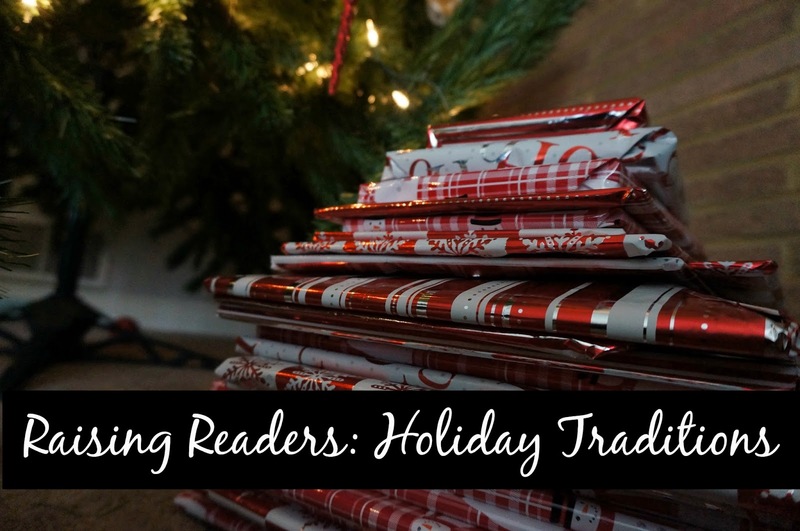 The holiday season is full of traditions, but my hope would be that after the presents are opened and the decorations put away, you still find ways to make books and reading a special part of your family culture. How do you use books to help celebrate the Season? What are your favorite holiday books? Tell me about your book traditions throughout the rest of the year. P.S. For more Raising Readers posts, click here. We are doing the book advent this year and I am so excited!! On Leif's suggestion I wrapped 2 chocolate coins with each book so they could enjoy a treat while we read. We'll see how that goes! Thanks for the wonderful idea Amy! I like this. Especially that you wrap books you already have and don't feel like you have to go buy something. Thanks for the idea! Definitely. I think it would be a short-lived tradition if I felt like I had to buy new books every year. Solid advice. "Find a way to make books matter." We definitely try to do that too. And you do a great job with it, too! This is wonderful! I also agree wholeheartedly with: "In your family, find a way to make books matter." I keep all of the Christmas books on high shelf in my room during the year. On Thanksgiving weekend I let my daughter go through them and pick the ones that she wants to read. No pressure, no suggestions from me. For us, this is working well so far. That sounds like a great idea, Jen! It's probably so exciting for your daughter when you pull down the books from that otherwise inaccessible shelf and let her do the choosing!